*Note: Some links in this article are affiliate links. If you decide to purchase, I may receive a small amount of that purchase. Links with an * at the end are affiliate links. When I started bullet journaling. In January 2017, I decided to try this analog way of keeping everything organized in a flexible and tailored format. I needed flexibility and something that I could customize to my needs and wants. I also didn’t want to be locked into doing things that didn’t serve me well. Most importantly, I wanted to keep all of this information in one place instead of on several sheets of paper all over my office. Having it in one place meant I knew exactly where to find it when I needed it. You can read about my first 30 days of bullet journaling here. It’s been two years since I wrote that article, and I am still bullet journaling today. I use a bit of a hybrid method: I use a dot grid hardbound notebook* for my bullet journal and a paper planner*. They each have their own roles, with very little overlapping. I’ve been able to customize this system to fit my needs over the last two years. I’m actually quite pleased with my current system and how I’ve hugely benefited from this system. A gIf flip through of the highlights of my 2018 bullet journal. 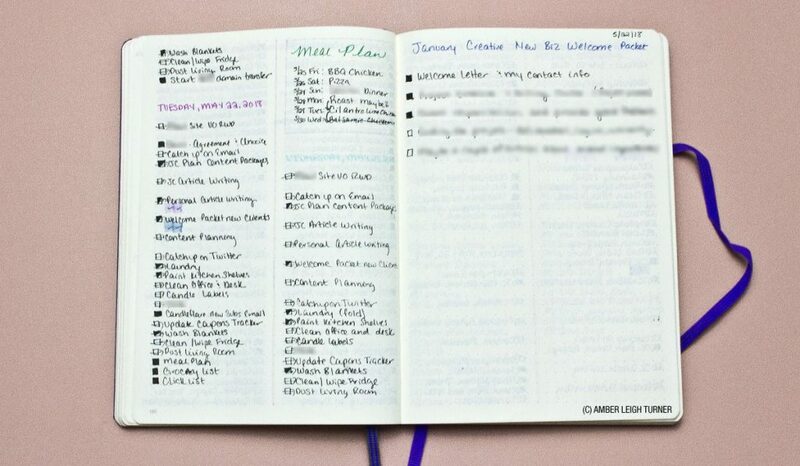 Bullet journaling is a growing trend among those who dislike digital organizing. They feel that organizing their life on paper is better for them than on the computer. 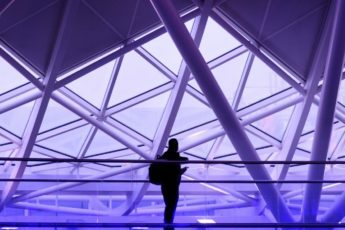 They also want the flexibility that planners don’t always offer. 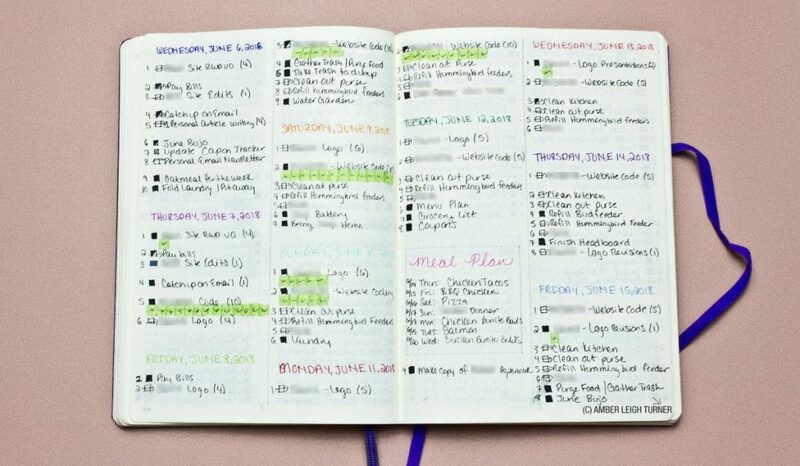 I’d like to show you how a freelancer like myself uses the bullet journal system for their daily work, to stay on top of tasks, monitor productivity to stay accountable, and to get things done without complicated systems to manage. 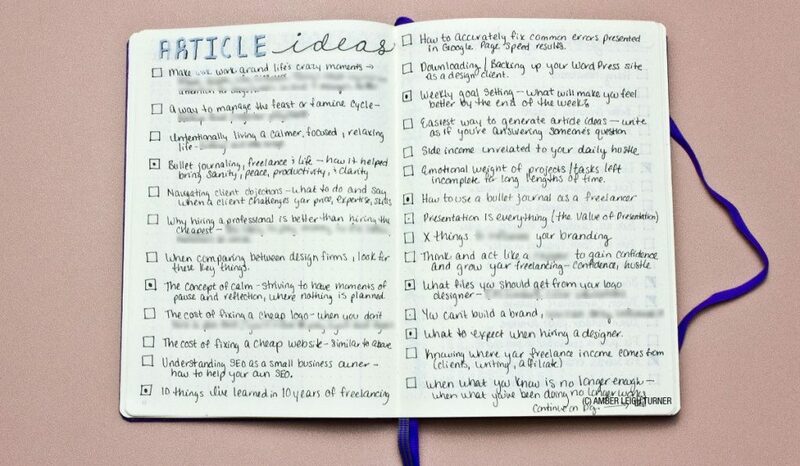 This article is for freelancers or self-employed who are looking to start bullet journaling. If you’re currently bullet journaling but want to change up how you track your work and life, keep reading. In this article, I give you ideas and insights into how the bullet journal system can work for freelancers and the self-employed. How I track productivity to get more work done throughout the day. The biggest thing I track in my bullet journal when it comes to my freelance life is my productivity. I’m a firm believer that you can’t change what you don’t keep track of. If I want to be more productive, having a record of how productive I’ve been in the past helps. Reviewing this record means I can make changes as necessary in the future. I heavily use the Pomodoro technique for tracking my time and productivity. I’ve slightly edited the Pomodoro technique to fit my needs (30 minutes instead of 25 minutes). Although I’ve slightly edited the Pomodoro technique, the same principles apply when it comes to tracking my Pomodoros. I have two ways I keep track of productivity in my bullet journal. 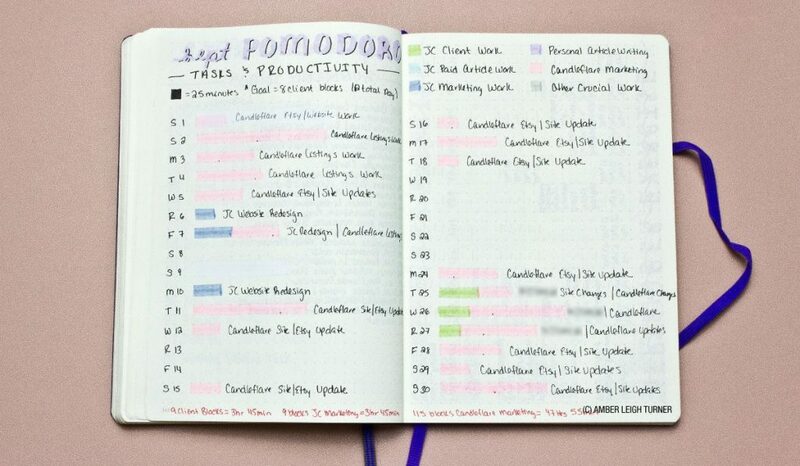 I keep track of my pomodoros on my daily to-do list and I have a monthly spread that allows me to see at a glance how productive I was that month. Not only do I track my pomodoros, but I also have the type of work that I do in different categories, each with their own assigned color. When I’ve completed a Pomodoro in a specific category (such as paid client work), I color a block underneath that item on my to-do list. When I write tasks that I will be doing Pomodoros on, I write the item down then skip a line before writing the next item; the skipped line is where I mark the Pomodoros for that item. At the end of every week or month, I go through each day and record the Pomodoros into the spread for the month. This way I can see how productive I was at a glance instead of looking through 30 days worth of tasks to get an idea. 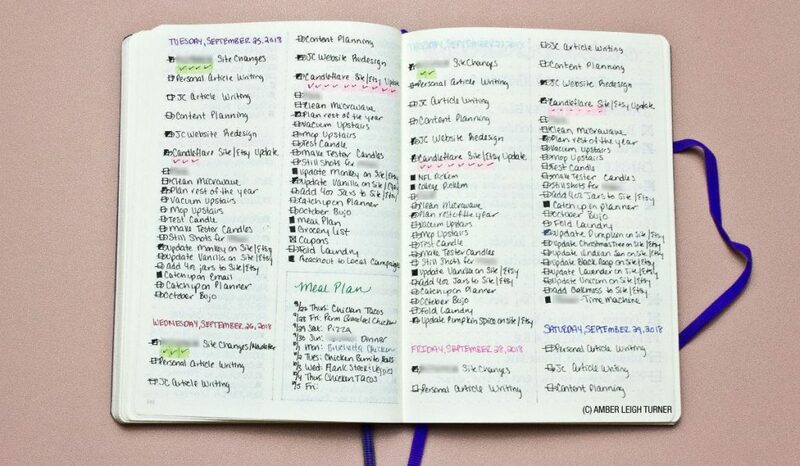 Create daily to-do lists to stay hyper-focused on the most important tasks that day. List of my daily to-do list in June 2018, showcasing how I keep track of my daily to-do lists and my pomodoros. I use my bullet journal mainly for tracking different things in my life and having a daily to-do list. I do not use it as a calendar like others may (I have a paper planner for that). My bullet journal helps me stay focused and accountable when I keep a list of what I need to get done for that day and refer to it throughout my work day. I mentioned earlier that I use a planner and a bullet journal. The planner is great to see things on a calendar, such as meetings, deadlines, etc. The bullet journal, however, works great to keep a list of tasks that I need to get done. 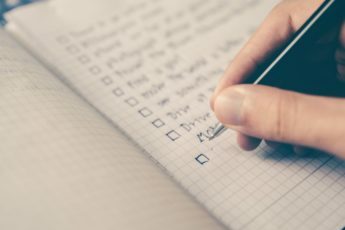 I have several lists of tasks for different things in my life, but the main one is my daily to-do list. List of my daily to-do list in September 2018, showcasing how I keep track of my daily to-do lists and my pomodoros. On this daily to-do list, I often have tasks that need to be completed or worked on that day. When I complete an item, I color in the corresponding block (or color in half when I’ve started it but it isn’t quite completed). At the end of the day, I migrate what didn’t get completed onto the new day’s to-do list. While I’m migrating, I’m also evaluating if the item should even remain on the list at all. My setup for this in my bullet journal is using a two column layout. I draw a line straight down the center of the page and keep my to-do lists in the columns. I use a different color Staedtler Triplus Fineliner* pen to write the date, then write all of my tasks in black below. For the next day, I skip two spaces from the last task, write the date, then write the tasks I didn’t get done from the day before and any new tasks for the day. Setting goals, writing them down and referencing those goals often keeps you accountable and on the right path. Everyone sets goals a little bit differently. However, it’s a great idea to have a place you write your goals down and refer to them often. I have a goal page where that month I write down the goals for the different areas of my life. These areas include my business, hobby business, personal blog, health and fitness, and personal life. Under each of those headings, I try to have two goals that I’d like to meet that month. I have goals that range from gross revenue goals, to major projects I want to get done, to goal weight to hit by the end of the month. 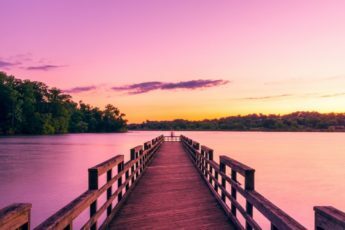 Mainly for my freelancing, those goals are often around gross revenue and productivity. I have one goal for a gross revenue amount I will work toward, and the other is often around a major project for my business (not a client project). 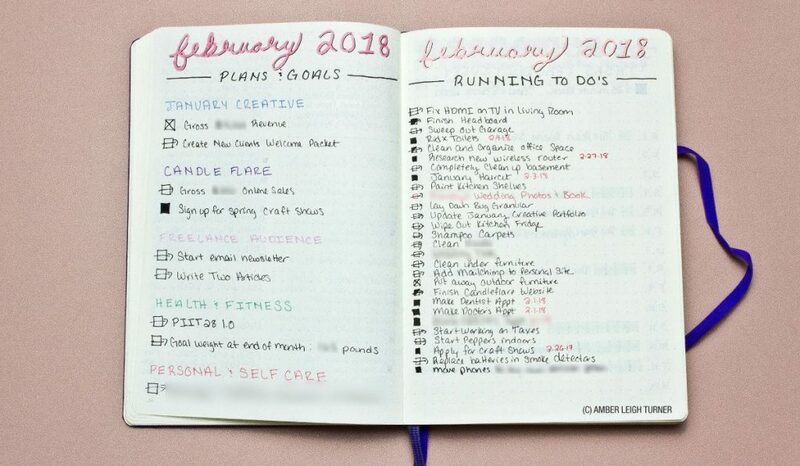 A tip on making sure you actually see these goals throughout the month when you use your bullet journal: write them on a page next to a page you’ll need to keep coming back to throughout the month, so you can see them continuously. I have my goals written on one page next to my monthly to-do list. I reference that to-do list several times a week as I take items off the monthly list and add to my daily list. This means I am always seeing the goals front and center. I’m reminded of what they are multiple times throughout the month, helping me stay accountable to them. Organize large projects and lists in a format that works for you. Brain dump for a project, planning out details in my bullet journal. Finally, another way I use my bullet journal in my self-employed life is when I’m working on a large project. I can set up pages in my bullet journal however I want based on what I’m doing. When there’s a large project, I have the flexibility to organize it in a way that makes sense to me. For example, if I’m in the beginning stages of a new project, I’ll spend time doing a braindump of all of the things involving the project. It’s handy to have my bullet journal to make a list of everything about the project and know where to find it. For projects that I’m in the middle of, using a page to help outline different parts of the project, dates, tasks, etc. is also extremely helpful. I can structure these pages however I need for what I’m wanting to keep track of and record. Plus, all of the planning is in one place, not on several pieces of paper or in different places digitally. Planning out the tasks for a specific project in my bullet journal. 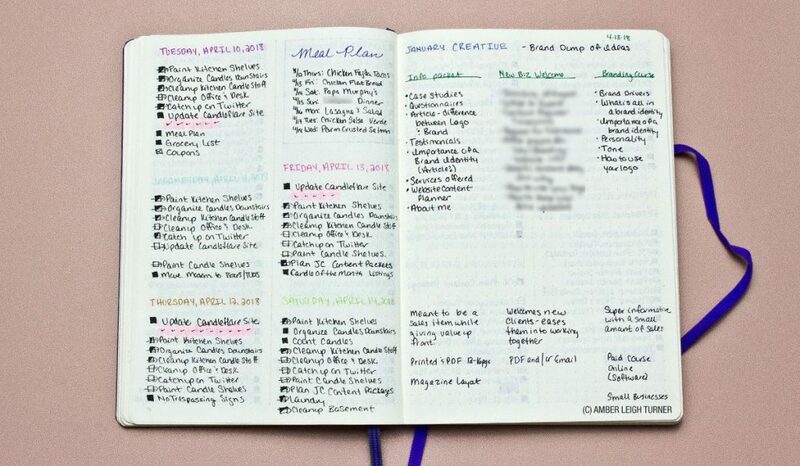 The flexibility of the bullet journal system when it comes to organizing large projects has definitely helped me in terms of actually organizing projects and tasks associated with the projects. I know where I’ve kept all of that information when it’s in my bullet journal. I can layout the pages (or spreads) based on what I’m doing, such as braindumps, dividing tasks out by weeks, organizing them in order that needs to be done, any new ideas, etc. Keeping a running list of article ideas I’d like to write or pursue further. I also keep running lists in my bullet journal for different purposes as well. For example, I have a constant running list of article ideas that I’d like to write about. You guessed it, the idea for this article is currently on that list as well. When planning out my content calendar, I take those ideas, decide if they are worthwhile, and lay them out on my content calendar. That’s how this article has come to light and why I’m writing it now. 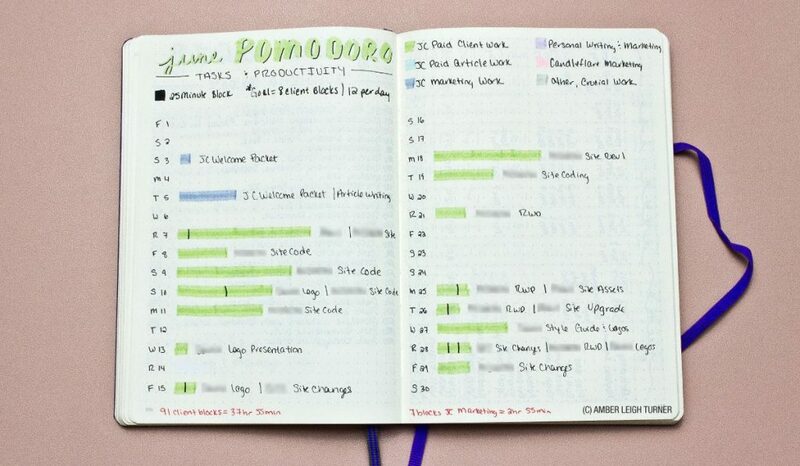 Make your bullet journal work for you to keep you productive and stress-free. I love using my bullet journal for my everyday life, and especially in my freelancing life. I’ve been able to keep more and better records of things that I need to keep track of or reference back on. Overall, this helps me stay productive every day since I started incorporating a bullet journal in my freelancing life. I’m able to see two different ways how productive I was on any given day, week, or month by having a productivity tracker. I can see exactly what areas I was working on the most in that month. Being able to track this and review it helps me stay accountable to my goals. It also tells me if I’m making progress toward those goals or if I’ve slacked off. My daily to-do lists help keep me focused and on task throughout the day. I have a handful of tasks that need to be done that day and I work to mark off the boxes as they are completed. It’s also on my daily to-do lists that I keep track of my pomodoros for the day. Setting goals are great. However, if you don’t have a place to write them down and reference them often, it won’t do you any good. Keeping goals in my bullet journal close to a page I reference often helps remind me of those goals. Finally, the bullet journal system is quite flexible and has helped me in any way I need it to function. It serves as a brain dump/journal for anything I’m working on and can help me organize a large project. Having my notes in one place without having several loose pieces of paper around me all the time helps me stay organized. Bullet journalling is great overall to help keep you organized, sane, and stress-free. 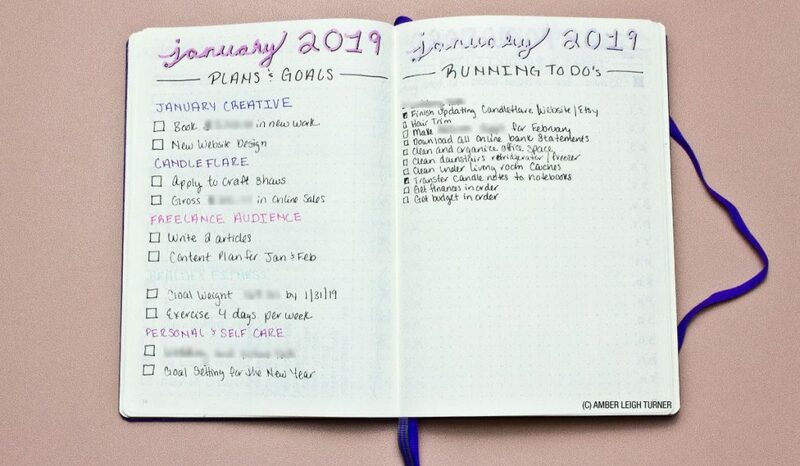 Incorporating your bullet journal into your freelancing life in any of the ways I talked about above can help you stay more productive and on task. Not to mention, it will also help make sure you’re on track to meet your goals and obligations.